So I really really really couldn’t restrain myself. You know those moment which makes you want to squeal and jump and exclaim and in awe all at the same time? That’s what astrophotography does to me sometimes, especially when the colours call out to me like a piece of art. It’s been a long time since I have carefully looked at the sky. We have been having haze here for more than a month, and it has been hazy every night, blocking out the dim light of the stars. It’s just such a waste and pity because Saturn is in the sky at night, but it’s hard to spot it in the haze. 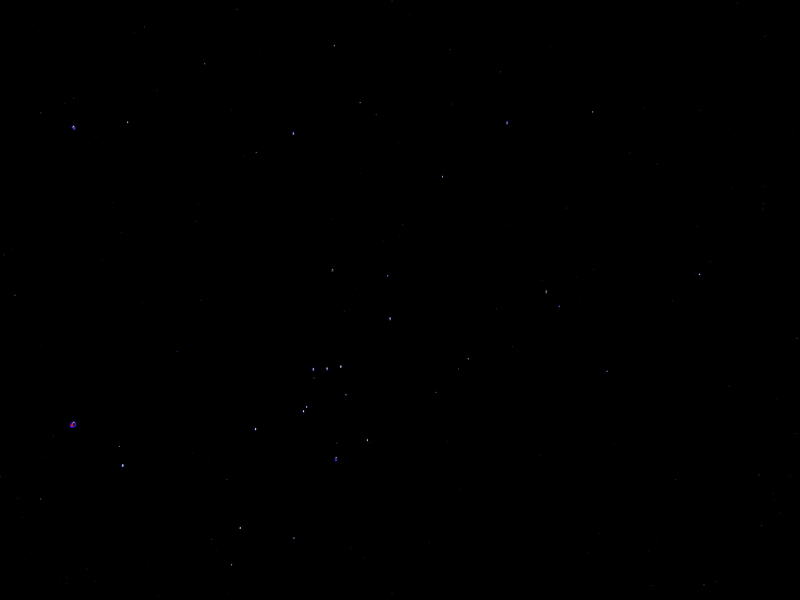 Looking at the photos make me miss stargazing. I’m just an amateur stargazer or astronomer if you would, and I don’t own any telescopes. I am lucky however, that my school organises mass stargazing sessions with telescopes so at least I get the opportunity to stargaze with telescopes every now and then. One day, I hope to travel to some place and really stargaze, in a place where there is minimal light pollution. I am thinking of using photos from APOD for personal projects, which doesn’t infringe the copyright. I’m not too sure what yet, but I’m saving this photo for the squealy feeling it gives me (and I probably need a better word for that). You can find more APOD photos here, just remember to check the usage rights if you are planning to use them in any projects. I shall not be held liable for any misuse! Pens are my one favourite supply that I don’t mind adding and adding too. They are relatively cheap and affordable supplies, comes in many many different colours and also many different styles! There are some fancy ones like metallic colours, ones with glitter, or even those that gives dimension when completely dry. Ah the possibilities! The most common type that I go to are just the normal gel ink pens though, because they are the most fuss-free, drying quickly and has the most colours. Today, I would like to do a review comparison between the Pilot Juice pens and Zebra Sarasa Clip pens. Before I bought either of these pen, I would always look at the two and wonder what is the difference. They are from different companies but the pens look similar, in terms of the size, and the range of colour they offer. Hopefully this short comparison would give you a better idea of how they compare with each other. Here’s how the pens look like, and how the ink appears on paper. You can click on the image to enlarge for a clearer look. 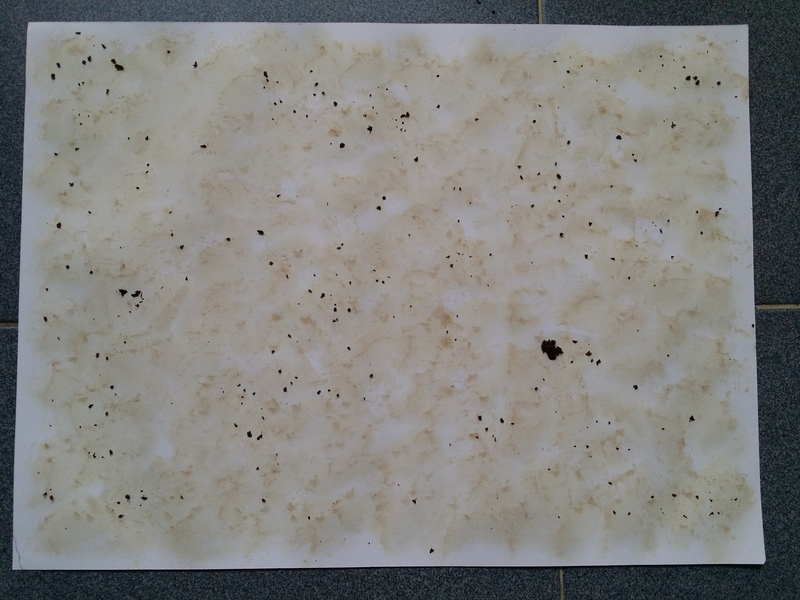 On paper, you really can’t tell the difference in ink, and both are waterproof. Granted, these are different colours, but the inks are equally opaque and flows well on the paper, making them both good writing instrument. I would say though, the Pilot Juice pen writes a little smoother than the Sarasa Clip pen, so if you like to write fast like me, and tend to join all your letters together, the Pilot Juice pen would be a better pen for you, and it’s what I like better. But don’t just take my word for it! What you can do is to go into a stationery store and try out the pens for yourself! This is what I will always do before I decide to buy a pen. Only by trying out will you find out whether it is suitable for you. Plus you get to find out whether the inks will dry up just by sitting on the store shelf. In terms of the grip and barrel though, both feels similar to me, having about the same size barrel, though the Sarasa Clip appears to be slightly bigger. To me, this barrel size is rather comfortable, though they would be considered a little larger than most other pens on the market (e.g. uniball, and any permanent markers). You might want to try out the how the pen feels too, because some people with smaller hands might find larger pens more uncomfortable to hold. Both pens comes in a larger variety of colours, and are sold in packs or separately. You can view the range of colours available here: Pilot Juice, Sarasa Clip. 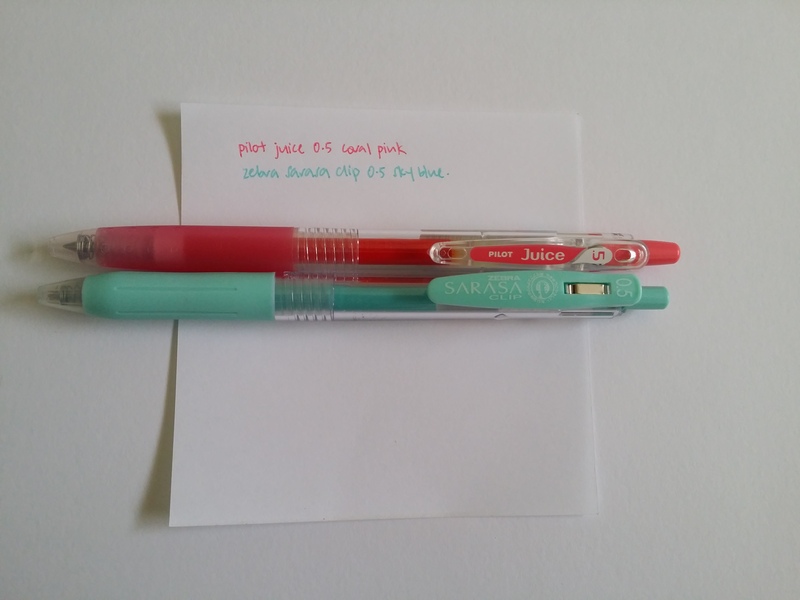 At a glance, the Pilot Juice pens offers a greater range of colours than the Sarasa Clip, but I need to say that the link provided doesn’t offer all the available colours for Sarasa Clip. How would I know this? Because the colour that is featured in the photo above cannot be found in the link. 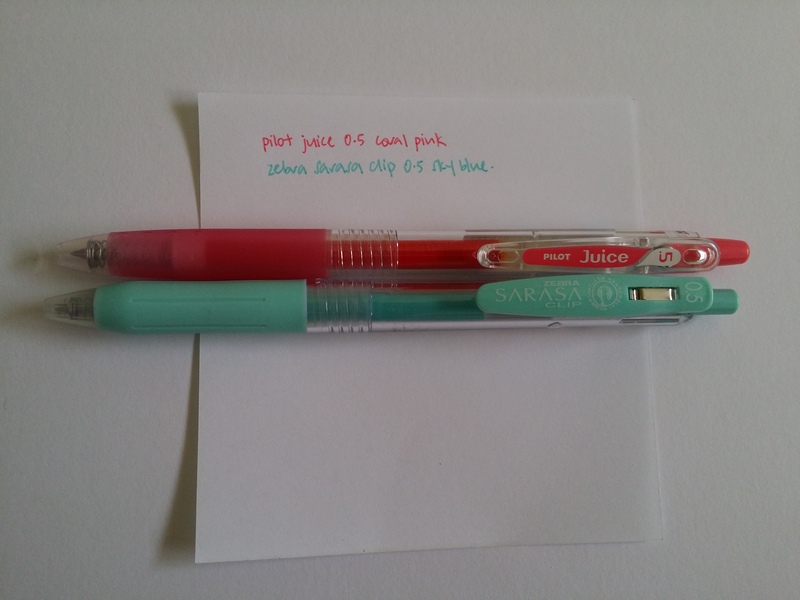 The Sarasa Clip pen that I bought is one of the pastel milk colour, and these colours are not found in the Pilot Juice series. A quick disclaimer: I do not know if what I have just said about the Sarasa Clip above is absolutely true. No information is stated on the Sarasa Clip pen other than the brand, so I am not even sure what the official colour name is (it might have been written in Japanese though, which I can’t read). But according to what I managed to find on Google, what I have written is what I think is true. And the most likely colour name of the pen I bought is Milky Blue Green. I didn’t have such an issue with the Pilot Juice pen, because the colour is clearly written on the pen. Both pens are not refillable for its colour range, though refills are available for basic colours that you would use in school (e.g. black, standard blue). They also have a clothes pin like clip for you to clip the pen to any paper or notebook. I don’t carry my pen around so this feature doesn’t mean much to me but it might be a bonus for you to have a pen that won’t slip off when you carry it around. And that is all for the pen review comparison I think. 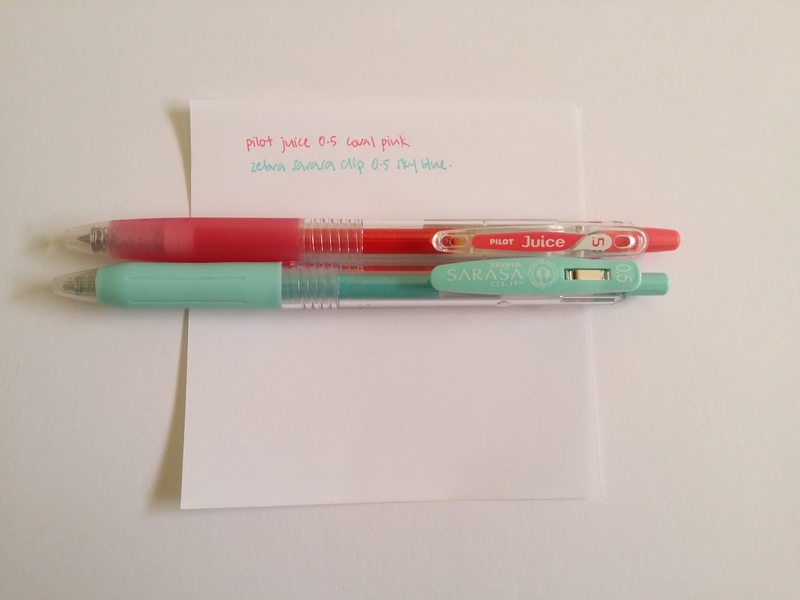 A final note before I end, I did say I like the Pilot Juice pen more, but I went ahead to buy the Sarasa Clip pen because it came in a colour that was special and I hadn’t seen around before. So moral of the story: Just buy what you like! Be it how it writes or just simply the colours available. Hope you enjoy this pen review comparison! It’s my first time doing a review so I’m not sure if I’m giving too much or too little information. Let me know what you think by commenting! Disclaimer: The links offered in the post are not in any way sponsored. They are linked because they offer a quick look at the pens. I bought all my pens in store as I mentioned, because I like to try out my pens before buying them, even if they don’t cost much. You will realise that I try not to mention the name of the website I link to because the purpose of the post is to purely offer a review of the pens, and not promote sales of the pen. All opinions are my own. I don’t have a regular posting schedule for my blog. Sometimes I post several at a go (staggered over days) and sometimes I go without any posting for longer than a week. It really depends on how things are like, and if I have anything to post in the first place. One reason why I don’t have a regular posting schedule is because it gives me stress. I am still in school and we already have many deadlines set from all the different classes. Having a regular posting schedule adds to that long list of deadlines and gives me unnecessary stress, especially if I cannot meet them. I need to be honest with myself too, because posting on the blog is definitely lower on the priority list. And that is also the practical way to go, because I don’t want to jeopardise my studies for my hobby – it’s a serious mark of ineffective time management. And so I post on the lull days, days when I allow myself to rest after all the assignments are submitted or when a series of hectic school days have come to an end. That of course depends on my assignment deadlines, thus a seemingly erratic posting schedule on my blog. Sometimes though, I don’t really have anything to blog about, because I haven’t got time to do any creative work. I then spend my lull time creating. I mentioned in a previous post about finding challenges an easy way to kick start my creative work, and this is partly because I need to do something within a short period of time. Sometimes, nothing gets done because I don’t feel like doing anything at all. I’m not sure if this is common with other people, because this happens to me only rather recently. Like, I never had the problem of absolutely not wanting to do anything when I was younger. I was told that this is mental fatigue, and it occurs more frequently than I would have like. In days like this, I just don’t do anything productive. It’s a very strong negative emotion, being turned off from doing things, and it also doesn’t feel appropriate to blog with that kind of emotions because this blog is my happy place. A lot of what I say are fueled by my emotions and I don’t want to channel negativity into my blog or perhaps worse, if they might get channeled to the people who reads them too. It’s just against my philosophy. So yeah, that basically sums up why I post the way I do. I’m still not sure exactly which is better – to post regularly or to post whenever I feel like it/have something to post. I know of bloggers who do both, and right now I am leaning towards the latter because I’m more comfortable with it. Ponderings is born out of this too, because when there isn’t anything arty to share, there will still be things related to creativity to talk about. A longish blog post, but written in response to the terrible week of deadline that is incoming (as I type this on Sunday). Hoping that the week will pass without too much pain. Hopefully, I am well enough to be back when the week is over. Till then, hope you manage to keep sane too. 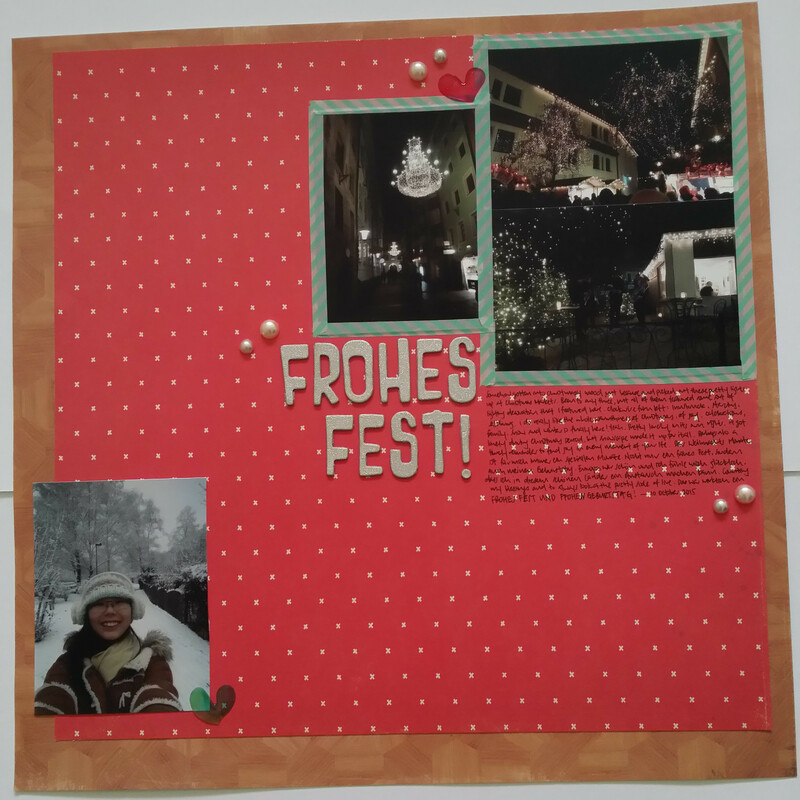 I thought I’ll talk a bit about my scrapbooking process after the last scrapbook layout I posted. I usually decide what to scrapbook by choosing a particular event/theme and then choosing the photos. Some times I’ll just print some photos that I know I want to scrapbook some day, so they all go into a small file of my scrapbook stuff, where I keep the things I want to scrapbook. There aren’t a lot of photos in there, because I find it hard to keep track and I don’t want to waste by printing photos if I’m not sure I want to scrapbook them or I’m not sure when I will scrapbook them. Many other scrapbookers also recommend printing out photos in advance which really facilitates the scrapbooking process (see: Amy Tangerine and Shimelle which unfortunately I can’t find the link again). I like to sit on my scrapbook pages, and spread out the work across several sessions. On the first time, I would pull out the background paper that would make the photos, and then I’ll try to imagine how I want the photos to appear. I’ll also pull out matching papers to mat the photos if I want the photos to be matted. If I still have energy left after all the decision making process (picking the best paper(s) is hard and tiring! ), I’ll think of where I want the title to be, and then look around my alphabet stickers stash to see if any of them work for the layout. Sometimes, they don’t work at all, and I’ll have to think of alternative forms of titling, so I’ll leave them be for the next time I look at the layout again. The second time, I’ll put down the title. Especially if they are not stickers I would need to work on that e.g. drawing out the title and cutting them out, hand stitching or painting them. If I paint my title, I would practice a few times on a piece of scrap paper, to get used to how I would paint them and work out the size of my title. 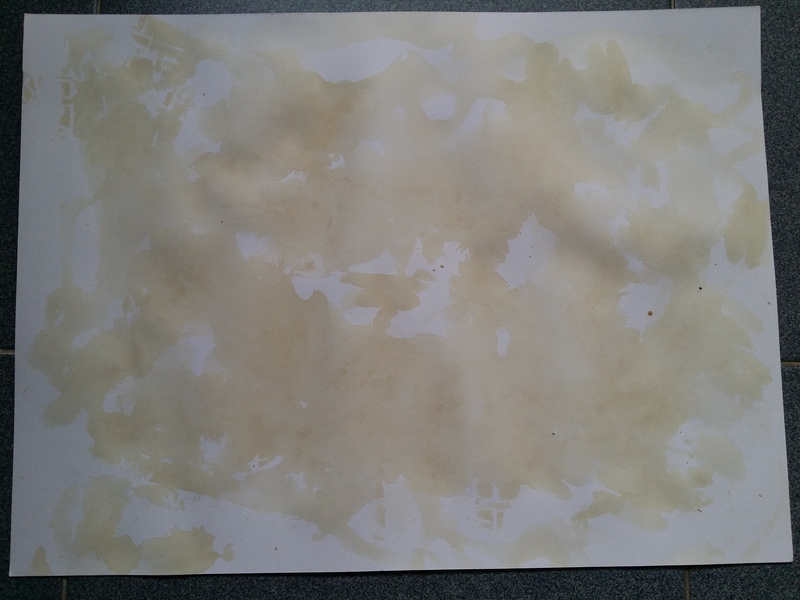 The scrap paper then become my reference when I actually put paint onto the page. On the last setting, I’ll work out the embellishments and the journaling. I like to work out where to place all my embellishments first before I start to journal, though the journal spot would have already been planned out. For embellishments I’ll just go to my stash and pull out things that I think might work with the layout. I only use a couple of the things I pull out. Sometimes, I will feel like it needs something particular that I don’t have it store bought, so I will make my own. Usually these would be like frames, enamel embellishments or something round. Occasionally these might be layout specific embellishments like the volleyball I created for this layout here. Once I’m happy with how everything looks, I will then stick everything done and the layout is now complete! I don’t arrange my scrapbook pages chronologically by when they happen, but just chronologically by when I scrapbook them. So there isn’t a clear order in my albums. It works better for me this way, and also its less work. My journaling style is more reflective rather than descriptive of the event so it doesn’t matter too much. This also frees me to scrapbook whatever that comes to mind rather than follow any specific order! Hope you enjoyed this little sharing on how I scrapbook. Another Scrapbook Sketch Challenge completed for the month of October! Picture taken is a little slanted this time but at least it’s clear (click photo to enlarge)! You can find the original sketch, as well as other take on the sketch challenge here. This time it’s Christmas theme, a little inspired by the Christmas themed card challenge from SC that I previously mentioned. The photos were printed at the same time and I spent the past couple of days working out this layout. I don’t exactly follow the sketch, because I like to have some freedom but the basic idea is there. I don’t actually have any Christmas themed paper because Christmas isn’t really a special occasion for me (my family don’t celebrate Christmas) so I don’t actually need to use any Christmas themed supplies. I was lucky then that I recently bought the Wonder 12×12 paper pad from Crate Paper and they had this red paper that can pass for Christmas. There are definitely more photos than the sketch asked for but I was sure I wanted to include all the four photos onto the same layout. I have the darker photos featuring lights decoration from last year’s Christmas Markets in several European cities and then a bright one juxtaposed at the bottom taken on the first great snowfall in Innsbruck on Boxing Day last year. The dark photos don’t show up too well on the picture but it’s possible to make out the details in real life. I did the titling with a silver Thickers from AC and then journaled in black in the spot to its right. I also framed the photos to make it appears as a layer using a mint green thin washi tape which reminded me of Christmas. The final embellishments just included a couple of heart stickers in coordinating colours (red on the top, and green on the bottom) and then a couple of pearls in a triangle formation at the top right cluster. I contemplated putting a set of them at the bottom left, but it looks too empty so I decided to leave the bottom area less embellished and simple to give the top cluster greater focus. Disclaimer: None of the links are sponsored. Only the mt tape and heart stickers links to the shop where I actually bought the products. All other product links are included for reference only. As you might know, last Saturday was World Card Making Day (WCMD) and I spent the weekends whipping up a couple of cards by joining Studio Calico’s WCMD challenges. Recently I found that I am liking challenges a lot because it provides a guideline for me to start something, and I don’t need to think too much on what I should do or where I should start. This is a prime example of thinking inside the box! It makes things much easier, because you don’t get paralysed from the many ideas that run through your head, and dispels any “What should I do?” wonderings. So that’s all for a quick sharing! Hope you enjoy the cards and feel more courageous to partake in challenges!